After a meticulous and in-depth search with the help of its French technological partner, the Brazilian group, ODEBRECHT has chosen a JUARISTI boring-milling machine, model MX9RAM, to machine key components for the future submarines that the Brazilian Navy is going to build at the new Itaguaí shipyard. 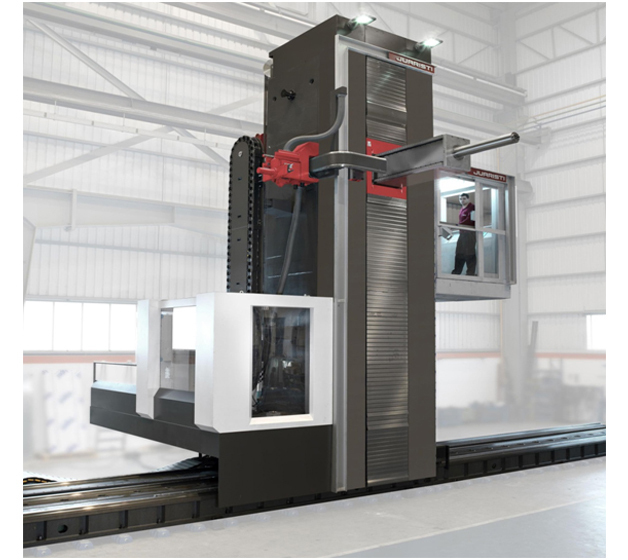 The excellent features of this great machining centre, together with its reliability and high performance, have been the key elements for JUARISTI to be selected from among the most acknowledged international manufacturers as supplier of this equipment that has X=8000 Y=3000 Z=1900 W=1000 travel, with an 1800 mm boring bar and an automatic millesimal milling head, together with an enormous 5000 x 6000 mm rotating table with capacity for 100,000 kg. This allows machining of 5 sides in one single set-up in parts of up to 8000 x 5000 mm. The MX9RAM model is top of the range within the MX linear guiding series with thermo-symmetric structure, being able to reach Y=7000 mm run. The main spindle reaches 94 kW maximum power and during tests with the customer it was verified that, thanks to the robustness and symmetry of the structure, combined with the generous guiding (4 vertical guides + 4 guides in RAM), this power was reached even in the most unfavourable conditions, with the RAM in its most distant position Z=1900. The automatic universal headpiece permits indexing every 0.001º on 2 planes, being able to reach any position in the space. It is loaded automatically through the pick-up type headpiece store. The model supplied is also equipped with a part touch probe and a tool control laser probe, as well as lubrication by MQL mist spray system, 40-tool store, boring bar support and shavings collector, making it a machining centre with extraordinary dimensions.